Our Auto Fill Kit is designed to maintain a consistent water level in water features, reservoirs and ponds by attaching to an outdoor water supply and automatically topping up the water level when it drops below the specified level. our Auto Fill Kit is ideal for making sure ponds and reservoirs stay at a consistent level of water by automatically opening a valve when the water level gets too low. 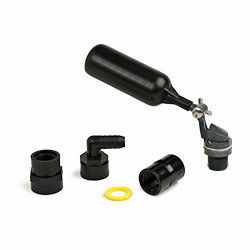 The Auto Fill Kit can provide up to 340 L/ph and can be connected to a water supply line using standard garden hose, irrigation line or rigid PVC piping using the included fittings kit.